An explanation by Terry Williams. I regularly get involved in battery explosions in an advisory role usually when someone’s battery has gone pop and they ask how to prevent it happening again. The most recent was a Police surveillance undercover van. Not the starter battery but the ancillary one in the back. First understand there are two sets of circumstances. One is a gassing lead acid battery, which on a modern car since around 1995 using lead calcium batteries is rare if the electrical system is in balance. This type of battery will only gas when it is charged vigorously such as by an overcharging alternator or a bench charge at the end of its charge. It would not gas in normal use. Additionally, they are mostly fitted with a spark arrester, which stops the flash getting into the box. The second circumstance is a spark to ignite the gas residue. In this case the likely source is likely to be either a loose terminal that sparked or a welded dry joint internally that gave way when the key was turned. If you put a voltmeter across the battery poles which are usually still Intact and you get a reading usually 12.5 volts or indeed any it means the internal circuit is intact and it then is almost certainly an external spark. Underuse of typical ‘weekend’ cars (like many Porsches) causes a battery to sulphate if the voltage gets low and can in certain circumstances cause gassing to occur. There are now available dry AGM batteries used mainly on stop start vehicles, which are a superb starter batteries, don’t explode and last nearly forever. I read with some interest about the exploding battery on a Porsche. After some 40 years of motoring the same thing happened to me a few months ago, for the first and thankfully so far he only time , but on a battery fitted to a 1925 Sunbeam car. 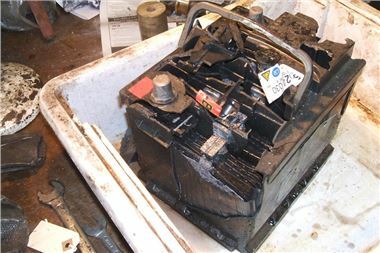 In this case the battery, some 4 years old, was fitted under the body in a well-ventilated open topped container. In such an old car the battery drain on starting is not heavy and the charge rate is small, around 8 amps. After some research I concluded that the reason it exploded was that in a modern sealed battery, no hydrogen and oxygen gases generated by charge/discharge escape but are held under pressure in the top space of the battery and are forced to recombine into water. Hence modern batteries never need topping up. The other factor at play here is that modern batteries are designed with very high load factors in mind. For example, the are often charged at a rate exceeding 50 amps. Because of this the construction inside is more compact and fragile than used to be the case. What happened in my case was that the battery having been trickle charged overnight contained hydrogen and oxygen under pressure in the exact quantities to violently explode if a spark were generated. This spark was produced inside the battery where a connection had shaken loose (no doubt due to our bad roads and speed bumps!) when I pressed the starter button. There is a serious health warning here in that all modern sealed batteries are potentially dangerous and I would now, after years of carefree existence, advise anyone not to go anywhere near a modern car battery being heavily discharged, such as when starting a car. As you can see from the photo they are potential unexploded bombs. Regarding your answers about battery explosion, I would like to add the following information: these explosions occur most frequently when acid level in the battery falls below the top of the plates. When this occurs, heavy discharges will cause flash over between the exposed plates, thus igniting any residual hydrogen mixture left in the space above. So keeping topped up saves bangs. Reading the "Lead astray" letter in your Expert Advice section this Saturday reminded me of an incident with an early Peugeot 205 GRD I had when on holiday in Wales in the mid eighties. I had parked the car for an hour and when starting it up, as soon as I turned the key to crank the engine over, there was a muffled bang with no further electrical power. Lifting the bonnet revealed a severely cracked battery case with acid flooding out. I was able to get the car started by disabling the solenoid cut-out and asking two passing youths for a push. A new battery was fitted so end of problem. The failure of the damaged, factory fitted battery intrigued me so, on close examination what had happened was internal fatigue of one of the terminal posts allowing internal arcing, closely followed by the inevitable explosion.